Vintage, womens shirt sewing pattern. No. 7353 Simplicity. Scarf pattern is also included. Wear it on your head or around your neck for different looks. Long sleeved, sleeveless and short sleeved styles. Notched collar. 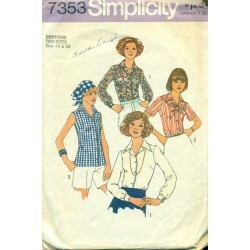 You can sew professional clothing for work or casual wear for at home with this pattern. 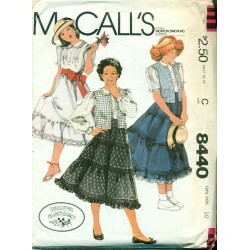 A nice vintage pattern from Simplicity. Set-in sleeves. The darts add a flattering, figure enhancing element to this sewing pattern. Condition : Checked and counted - complete with instructions. Previous owner's name written on the front of the envelope.